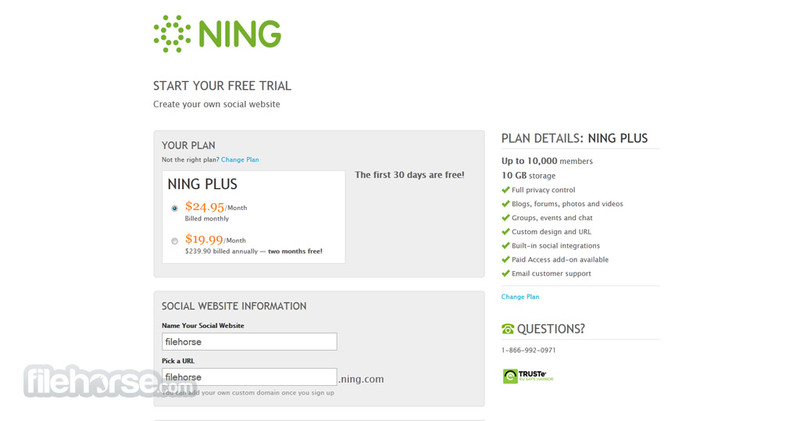 If you ever wanted to create your own social website, Ning is the perfect platform for you. With the help of their activist, organizers, marketers and influencers, you will in no time create online site that will be center of social conversations and actions. With long experience in online space and knowledge of the social interactions, your brand and business will very quickly reach millions of people all around the world and unite them in a powerful social experience that you control. Create a Social Networking Site now! If you have ever wanted to create your own social network built around one location, then Ning is the perfect online destination for you. 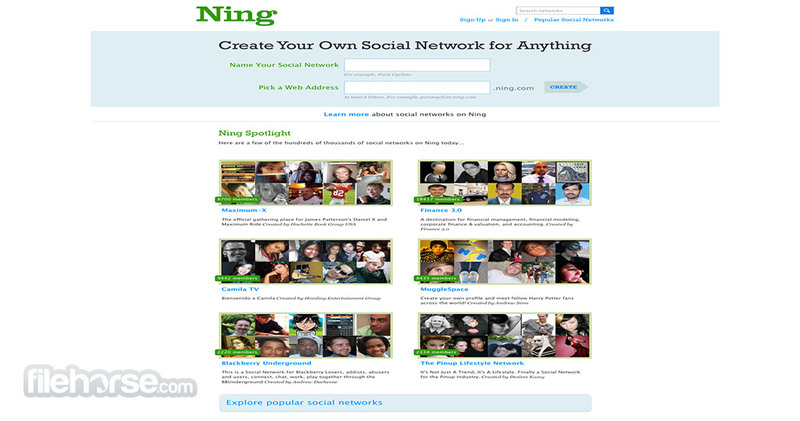 Ning enables creation of any kinds of personalized social networks - wheatear if you are in school and want to create your own private social network, you are a businessman who wants to organize his workforce, or just a web designer who wants to promote your online creation by infusing them with the presence of the thriving online community. With Ning, sky is the limit. Launched in October 2005, this popular online platform for creation of personalized social networks has managed to be responsible for the creation of over 90 thousand social websites, all customized in their distinct way and used for various purposes and thriving communities with shareable forms, activity streams, chats, groups, search engines for easier discovery, plugins for other popular social networks and even features for business that want to extract revenue from traffic on their social site. There are many kinds of website builders on the internet, but Ning manages to distinguish from them by offering you all the necessary tools for creation of one centralized location that will attract visitors, fans, followers and customers. Creation of the entire social website is easy and intuitive, based entirely on you controlling 80 design settings that can customize your site to whatever degree of your choice. You can start building from template, or start coding which is best suited for professional designers). From the moment you arrive at Ning.com you will be welcomed with the elegant and modern design prepared to answer your entire website editing needs. Each tool is presented to you in easy and intuitive way, enabling even novices to easily manipulate them and create site that will be easily appreciated by professionals, clients and all internet followers. All relevant data that you need to know during website creation is easily presented (even color coded!) so that you can always know what you need to do when manipulating fast and sleek editor interface. For several years Ning offered free accounts that were responsible for the creation of the majority of its custom social networks from all around the world, however now you can only gain access with several tiers of paid subscriptions. They range from $2.95 per month for basic package (up to 150 social network members, 1GB of storage space, no personalized advertisements and other functions like blog, custom like icons, photos, forums and more) to the most expensive Pro plan that will cost you $%59.99 and give you unlimited members for your new site, 20GB of storage, up to 10 Ning apps and access to all other features. Ning can be easily be recommended to all users who want to create their own personalized social network, and therefore by using it you will not be able to get some of the advantages that you can find in other popular social destinations (for example suddenly finding your long lost friend from youth). However advantages in the sense of creating your own open or private social network will be incredibly attractive to business and websites that like to create their own, new and unique social network. Create a Social Networking Site now! Start with the growing collection of eye-catching themes; then in a few clicks customize your site using 80+ design settings. Or if you’re a design pro, use CSS to create your own look & feel. Hit the ground running to engage and grow your community (big or small). Organize events. Use member profiles to bring faces to names. 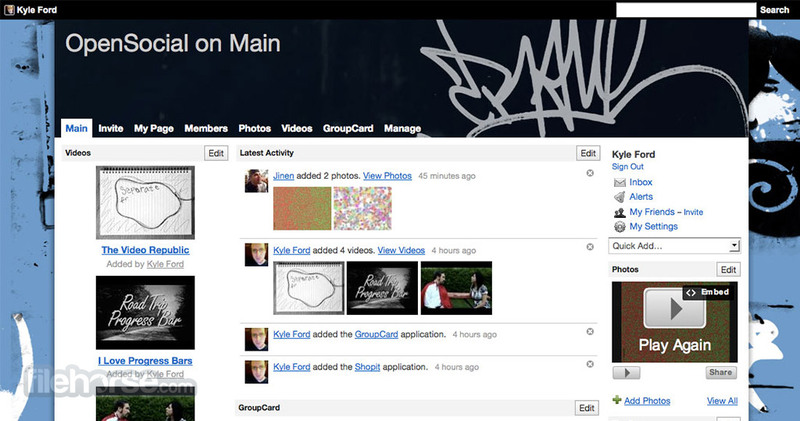 Get everyone talking through groups, forums, chats and activity stream. Plus more (lots more). Share the stage to keep content fresh and the conversation going. Let members share photos, voice opinions in comments and blogs, bring stories to life with videos, and feed into the excitement of interaction. Thanks to built-in integration with Facebook, Twitter and YouTube, it’s easy to maximize your reach and spread the word. Plus add great Ning extensions for irresistible social functionality – live video streaming (Ustream), photo stickers and effects (Aviary) and email marketing (Constant Contact). Create a Social Networking Site now! Building a profitable social business has never been simpler. Charge members (or collect donations) for site access, premium groups and content. Also run your own ads, or sell branded merchandise.